At approximately 4:00am on March 9, 1916, about 485 Mexican revolutionaries attacked the sleeping town of Columbus, New Mexico. Led by Mexican General Francisco “Pancho” Villa, the fighters crossed the border into the United States and took the small town and its adjacent military encampment, Camp Furlong, completely by surprise. The assault was the only ground invasion of the continental United States after the War of 1812. Ten American civilians and eight U.S. soldiers lost their lives before Villa’s troops had to retreat to Mexico. A long period of Mexican political unrest and controversial American foreign policy fueled the historic invasion. The attack led to further contention between the United States and Mexico when President Woodrow Wilson ordered a punitive expedition into Mexico to capture Villa without first consulting the Mexican government. General John J. Pershing gathered several thousand US troops at Camp Furlong for the undertaking. This massive expedition, though ultimately unsuccessful, would prove critical in testing tactics and equipment that were essential to US military triumphs during World War I. Today the town of Columbus and Fort Furlong National Historic Landmark district helps preserve and interpret this important heritage. Some of the district is included in New Mexico’s Pancho Villa State Park. The district includes extant buildings from the time of Villa’s raid and Pershing’s military occupation, as well as historic ruins and remains, numerous exhibits, a museum, and a full-service visitor center. The 1916 raid of Columbus is only understandable within the context of Mexican and American socio-political affairs around the turn of the 20th century. From 1877 to 1911, Porfirio Díaz led a powerful dictatorship. During his time as the president of Mexico, he achieved great stability for the country and long-term peace, yet most Mexican civilians remained landless and poor. During this same period, thousands of Americans migrated south to Mexico to profit from Mexico’s oil and other rich natural resources. By 1913, American investments in Mexico totaled around $1 billion. Great political unrest began to settle in around 1913 when Francisco Madero overthrew Díaz, promising sweeping land reforms. Just two years later, Victoriano Huerta overthrew Madero. In the midst of the turmoil, American investors in Mexico insisted that President Woodrow Wilson intervene to restore order, a demand the United States government refused to satisfy. Instead, President Wilson declined to recognize Huerta’s government and allowed international arms sales to revolutionaries like Venustiano Carranza and Pancho Villa, who opposed Huerta. Dissatisfaction and tensions between the two nations continued to mount, even after Venustiano Carranza overturned the Huerta regime in 1914. Villa himself refused to recognize the new government and continued his revolution even after the United States, his former arms supplier, extended formal diplomatic recognition to the Carranza administration. The following year, Villa and his troops took a further blow from the U.S. when Wilson allowed Carranzista troops to use the railroads in the southwestern United States to move reinforcements against Villa to Agua Prieta, just across the border from Douglas, Arizona. The result of this U.S. aid was a resounding Villista defeat at Agua Prieta on November 1, 1915. Although the exact reason for Villa’s attack at Columbus, New Mexico is unknown, the theory is that Villa was mainly seeking revenge after the Agua Prieta incident. Villa also likely needed to capture necessary food, clothes, munitions and other supplies for the ever-dwindling band of revolutionaries. Before the night of Villa’s attack, Columbus was much like any other small American border-town. Occasionally violence from the Mexican revolution would spill over and cause disruption, but the town was largely unfazed due to regular protection from a detachment of the US 13th Cavalry, stationed next door at Camp Furlong. This all changed the early morning of March 9, 1916.
as part of the historic district. At approximately 4:00am, two bands of Villistas struck the sleeping town simultaneously. Hundreds of the Mexican raiders swooped into the streets on horseback, filling the air with rifle fire and shouts of “Viva Villa! Viva Mexico!” The assault took Columbus citizens completely off-guard, including the 350 Federal soldiers located nearby at Camp Furlong. As the Mexican attackers set fire to the town’s main core and commercial district, many families fled in fear into the dark desert, leaving their homes to burn. Others sought refuge in the Hoover Hotel or old schoolhouse, thick-walled adobe buildings that were relatively bullet and fireproof. Troops at Camp Furlong were not quick to respond. Keys to the locks protecting stored munitions apparently were lost, so locks had to be smashed to gain access to necessary weaponry. Many of the fort’s intricately designed and improperly tested machineguns ended up jamming. Finally, after an hour and a half of fighting, the US troops were able to respond to the attack with murderous crossfire, and the Villistas withdrew. Much of Columbus was in flames and 18 Americans and approximately 80 Mexicans lost their lives. In addition to the significant events of March 9, 1916, itself, the Columbus attack caused a punitive military reaction that only further complicated Mexican-American political relations. As public outcry regarding the attack swept the United States, President Wilson felt forced to retaliate. Without consulting Carranza or other Mexican leaders, the president commanded General John J. Pershing to lead a large military expedition into Mexico to capture Villa and prevent further raids. Thousands of US troops reached Columbus just days after the raid. The small, mostly destroyed town became a beehive of military activity. The Southwestern and El Paso Railroad Depot, built in 1902, had survived Villa’s raid and became a critical point of entry for hundreds of trucks, motorcars, munitions and crates of supplies. 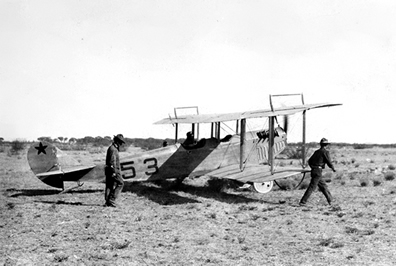 The 1st Aero Squadron transported aircraft from Fort Sam Houston, Texas and established the United States’ very first operational airbase to the southeast of town. General John J. Pershing’s punitive mission into Mexico sought to capture Pancho Villa after the 1916 attack on Columbus. Planes, such as this Curtiss JN-3 “Jenny” were used in military operations for the first time. General John J. “Black Jack” Pershing led his 10,000 troops on the 11-month, 500-mile pursuit of Villa into Mexico. Pershing’s expedition has been dubbed the last of America’s 19th century wars and the first of those in the 20th century because of its reliance on motorized power and airplanes, rather than on the horses that were used in previous military endeavors. As a result, equipment modernization and mechanical specialization during the time of the 1916-1917 expedition proved essential to U.S. military success during WWI. By early 1917, Villa had yet to be captured by Pershing’s punitive expedition. 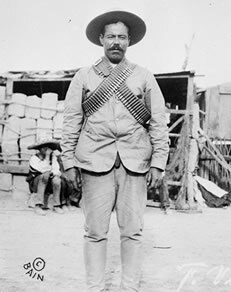 Carranza’s regular Mexican soldiers had attacked the US troops, demonstrating that Carranza opposed the expedition to capture Villa and threatening war between the United States and Mexico. President Wilson became convinced that the revolutionary was no longer a major threat to the United States and ordered Pershing and his troops to pull out of Mexico. The last members of Pershing's command marched into Columbus in February 1917, almost a year after Villa's initial raid. 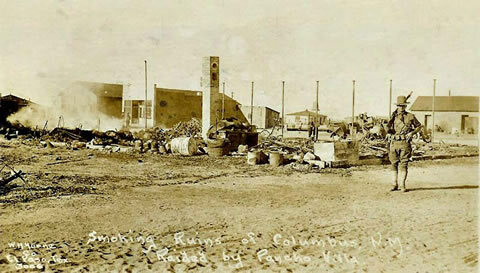 Though many of the pre-raid-era buildings in Columbus burned to the ground during the attack, several still stand today. Both the schoolhouse and the Hoover Hotel, which protected Columbus citizens during the raid, remain. The train depot and is its associated pumphouse, section house, and customs house are still in place. Built c. 1902 by the El Paso and Southwestern Railroad, the structures played an important role in the commerce of Columbus before the raid, and military operations thereafter. 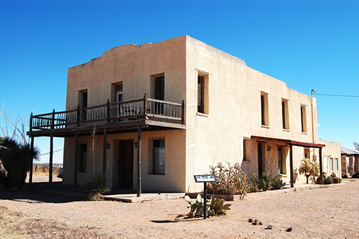 Today the customs house serves as a visitor center for Pancho Villa State Park. The Columbus Historical Society restored the depot, which is now open daily as the Columbus Train Station Museum of community history. For more information, see the museum’s website. Pancho Villa State Park is on the former site of Camp Furlong. Remnants of the John J. Pershing military era dot the landscape. These include the c. 1916 Camp Furlong Recreation Hall, the ruins of several adobe officers’ quarters, and the nation’s first military airfield, which is still in use today. The park provides extensive interpretive signage and exhibits throughout the district. A new 7,000-square-foot exhibit hall now houses artifacts and informative displays that tell the story of Columbus from 1910 through the beginning of U.S. involvement in World War I. Holdings include a full-size replica of a Curtiss JN-3 “Jenny” airplane, a 1916 Dodge touring car, historic artifacts, and military weaponry. An armored tank stands as a sentinel outside the facility. The Village of Columbus and Camp Furlong is a National Historic Landmark located in the village of Columbus, on NM Route 11, 35 miles south of Deming, NM. Click here for the Village of Columbus and Camp Furlong National Historic Landmark file: text and photos. Part of the district is included in New Mexico’s Pancho Villa State Park. The park’s main exhibit hall and visitor center is open year round, from 8:00am to 5:00pm seven days a week. Admission to the park is $5.00 per motorized vehicle. For more information, visit the park’s Pancho Villa State Historic Park website or call 575-531-2711.